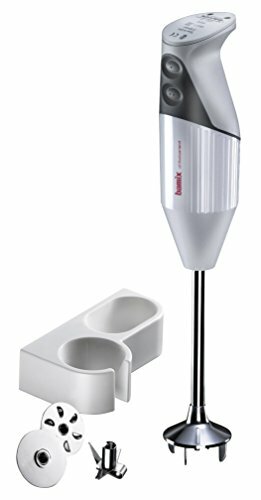 Looking for a large immersion blender? We've listed out 7 hand blenders with long shafts for when you're dealing with really big pots. 2. 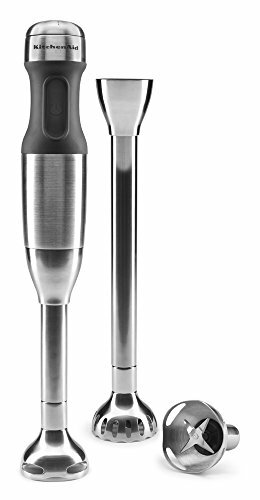 KitchenAid KBH2571SX Immersion Blender (13" Long Shaft)"
Made of heavy-duty plastic, as well as stainless steel, this powerful immersion blender can easily power through batter, soup, and sauces without any problems. The blades can reach rotation speeds of 2000-14000 RPM, which is fast enough to handle even the toughest and most fibrous vegetables that you want to blend, puree, or chop. 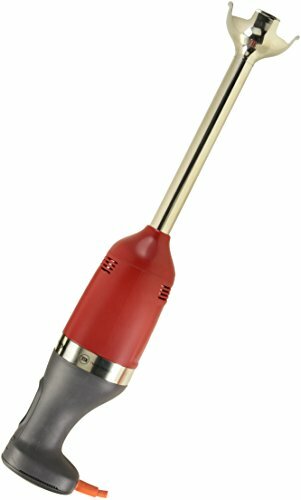 The rubber handle is not only comfortable to hold, but the additional hand grip ensures that you will be safe when using this immersion blender and that it will not get out of control when you have it in operation. Additionally, since the entire blender is over 15” long, it’s easy to see why you will be able to blend even the deepest sauces and soups without any problems, allowing you to handle up to 35 gallons of food at one time without having to worry about blending in batches. This KitchenAid blender boasts two different blending arms that you can easily swap out so that you can blend even the biggest pot of soup without having to worry about not being able to reach the bottom. Additionally, the bell blades are interchangeable, which allows you complete control over the food that you are making, as you can puree, crush, froth, and more, without any difficulty. Thanks to the whisk attachment, you can easily whip almond milk into a froth for a drink or emulsify vinaigrettes for your salad. Use the chopper attachment and the blending pitcher to really make prepping for your next meal a breeze. Some users struggle with keeping the mini chopper from leaking when it is being used. Waring has long been known as being able to produce high-quality kitchen equipment, and this blender is no different. It is not only incredibly lightweight, even though it boasts a 10” shaft, but it is easy to use and makes blending safe and fast. Thanks to the large shaft, you can easily blend very large amounts of food at once. Choose between the two speeds to ensure that you have the best results when using this blender, and don’t worry about the head coming loose from the shaft, as you do not have optional heads to switch out. With a 350 Watt motor, you have plenty of power to chop through any food you want with ease. No matter what kind of food prep you need to complete, you can rely on this durable and powerful immersion blender from All-Clad to make short work of what needs to be done. 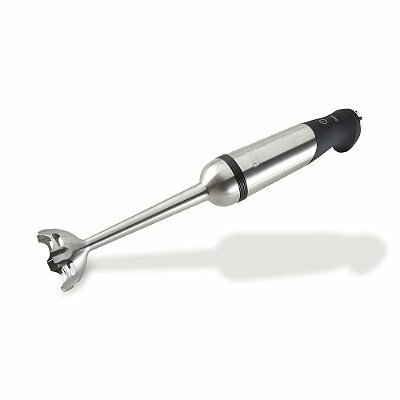 It is able to blend, whip, chop, and puree quickly and easily, thanks to the very powerful motor. Adjust the speed using the variable speed control dial so that you don’t have to worry about burning out the motor while prepping food. The large blending head not only makes short work of anything that you need to blend, but also prevents food from splattering while in use. If you want more attachments, you can purchase a whisk as well as a mini chopper separately. 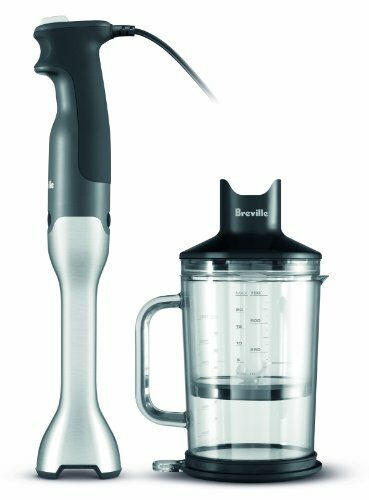 Unlike other immersion blenders that have problems with increased suction that prevents even and efficient blending, this immersion blender from Breville has a unique design inside the bell that helps to reduce the amount of suction. Additionally, the shaft is 8 inches long, which makes it easy to easily blend most anything without worrying about liquids getting into the motor if you put the blender in too deep. Thanks to the adjustable speed, you have complete control over how fast the blender is working, which is useful to help prevent spills. The non-scratch base means that you can use this immersion blender in all of your favorite pots without worrying about damaging the surface. With two different speeds to choose from as well as a 2-year limited warranty, you don’t have to worry about this immersion blender from KitchenAid not being able to perform the way that you need it to. 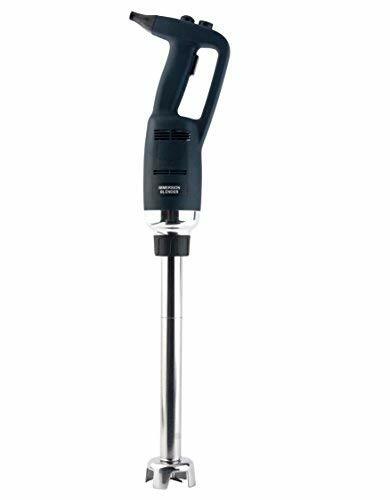 Unlike some other immersion blenders that have a very short shaft which limits the amount of food that you can blend, puree, or chop at a time, this immersion blender has a 12” shaft that is designed to easily power through a lot of food at once without any problems. Thanks to the wall mount, you will always know exactly where your blender is located and can grab it quickly when you need it. Additionally, the multipurpose blade doesn’t ever need to be removed or sharpened, as it can power through most anything without any problems. With three different interchangeable blades for you to choose from, you will have complete control over your meal prep when you buy this powerful immersion blender from Bamix. The three blades are for chopping, blending, and aerating, which will make you feel like a true professional in the kitchen. Not only is this immersion blender incredibly powerful and easy to use, but it is balanced so that you don’t have trouble holding it. The decreased vibration makes it much quieter, as well, so you won’t bother others when using it. Rely on the two different speeds for control over your meal prep, as well as pulse action to help chop your vegetables.